Mahishasura Mardini Stotram is one of the most popular bhajans dedicated to Goddess Durga and is believed to have been composed by Ramakrishna Kavi. The prayer begins with the lines Aigiri Nandini. This particular pdf format of the Mahishasura Mardini Stotram Text contains the verses in Hindi with English meaning of each stanza. The English translation is done by S N Shastri. Goddess Durga annihilated Demon Mahishasura (the invisible demon) and was given the title Mahishasuramardini (conqueror of Mahisha). The story is found in Devi Mahatmyam part of Markandeya Purana. 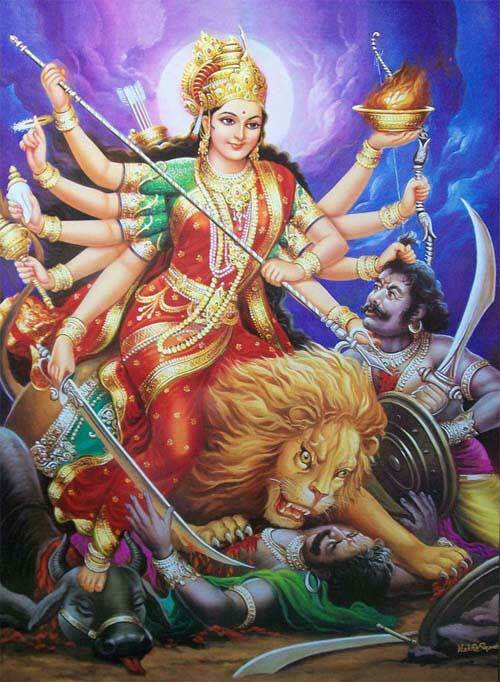 Generally portrayal of Mahishasuramardini is that of Durga appearing with eight hands riding a fierce-looking lion.